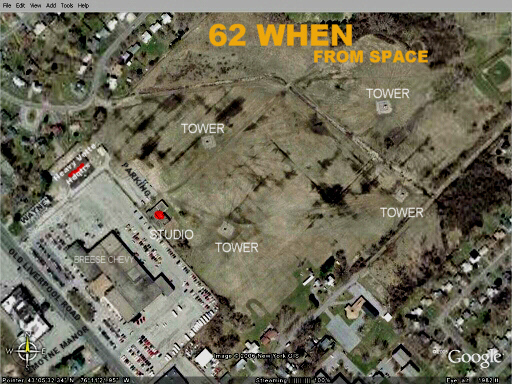 WHEN radio's Syracuse tower farm and transmitter site. WHEN's studios, as a result of consolidation, were moved from their 620 Old Liverpool Road (Liverpool) location to the Clear Channel station cluster on Plum Street, Syracuse in the early 90s. In this Google space photo you can easily see the station's 4 tower array - each tower 78 meters(256ft) tall. Towers for a station operating at 620kz would normally be taller but because they are located near the airport their height was restricted. Tower#3 (labeled below) is used for the station's 5kw daytime signal. The building where the station's studios formerly were located is denoted by the red dot. Other surrounding buildings are also easily identified in this satellite shot. Former Chief Engineer Roy Taylor tells how the signal got through system to the towers: "... In the early days the transmitter power went directly to a building in the center of the field just past the creek to a building that housed the phasor/power cabinet. That phasor/power cabinet would distribute proper power and phase to each tower. Jeff Baker may have been in charge when the new phasor/power cabinet was installed in the building and transmission lines were buried in the ground. The transmission lines, tower lighting and return sample cables were in troughs above the ground. Jeff buried the cables and when I had to dig a line up I called him to ask how they were buried to warn the backhoe operator what he would hit first. WHEN had what they called open wire transmission line." Former Chief Engineer Jeff Baker comments further: "... Roy is right about the phasor building being in the middle of the field. Lines for monitoring ran overhead hanging from messenger cables (similar to some telephone lines you see along streets) and the transmission lines were open wires supported by special insulators. We were having problems with the monitors and even though we were planning to replace all of the tuning equipment and bury the lines, our consultant had us replace the overhead lines and later bury them. This caused problems because the overhead lines had to be grounded at each post and later, when they were buried, we had to seal the openings. As I understand it, there were some later problems with leaks, even though we used multiple layers of tape and then potted the joints in an epoxy compound. I do remember Roy calling about the location of the excess lines (they were equal length go avoid having readings that did not relate to the actual rations) so the excess had to be buried. But at the time, I could not remember where they were. Just before we replaced the lines, some kids with a BB gun shot out some of the insulators and took us off the air. Newsman Jeff Scheidecker chased after and caught them, but the station decided not to prosecute or bill their parents for repairs." just off Old Liverpool Road.